Last year, we asked readers with Huguenot ancestors who once lived in this neck of the woods to come along to place their forebears on the Map of Huguenots in Spitalfields at Townhouse in Fournier St and more than three hundred of you did so. 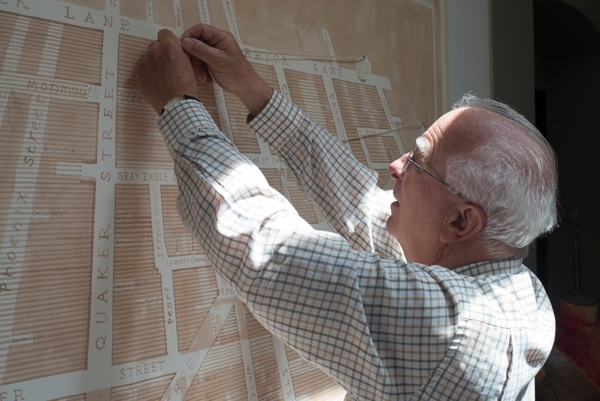 Cartographer extraordinaire Adam Dant drew a huge map as big as a wall and Stanley Rondeau, whose great-great-great-great-great-great-grandfather Jean Rondeau arrived as an immigrant in 1685, was the very first put a pin in it to mark his ancestor. Now Adam Dant has painstakingly inscribed all the entries on the map and it is almost full. 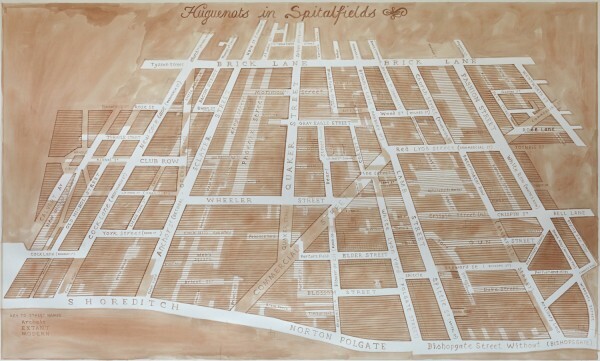 Before the Map of Huguenots in Spitalfields is printed shortly, it will be displayed again at the Townhouse for the week beginning June 1st – so those who have ancestors on it may come along to check that the facts are correct and offering a last chance for anyone who wishes their Huguenot forebears to be included. 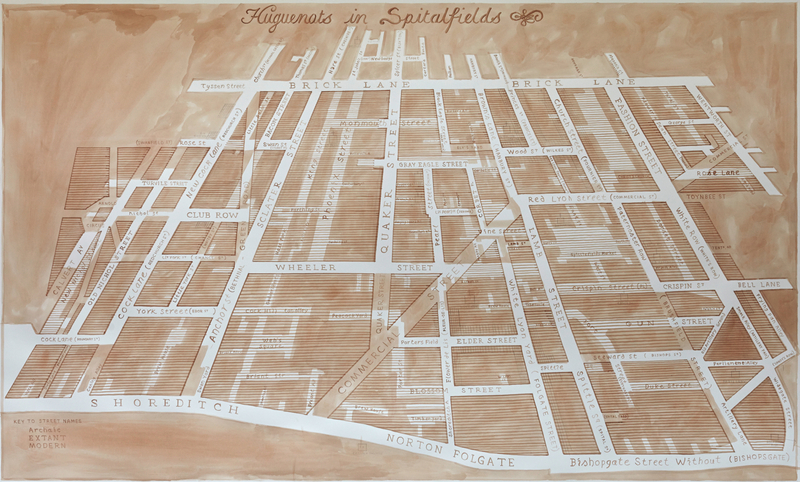 Later in the month, the Map of Huguenots in Spitalfields will be available as as limited edition print and everyone whose ancestors are on it will be invited to a party to meet each other and witness the unveiling of the completed map. Spitalfields was the most concentrated Huguenot settlement in Britain of the twenty-five thousand French Protestants who fled across the Channel, to save their lives after the Revocation of the Act of Nantes, in 1685 – and who thereby introduced the word refugee into the English language. 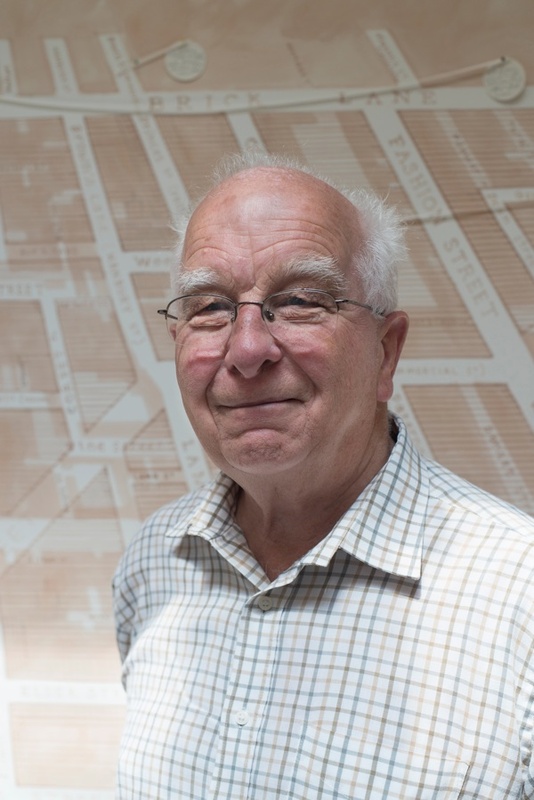 The Map of Huguenots in Spitalfields is at Townhouse, 5 Fournier St, during the week beginning 1st June and the completed map will be unveiled later in the month. fantastic idea. Now, my ancestors lived at Gun Street in the 1850′s- not Huguenots but Jews. They also lived at an address called the coal shed in Artillery Lane -don’t know where that was ! Please would you tell me whom to contact in order to add a name to the Huguenot Map. Sorry if I have missed something which is staring me in the face! 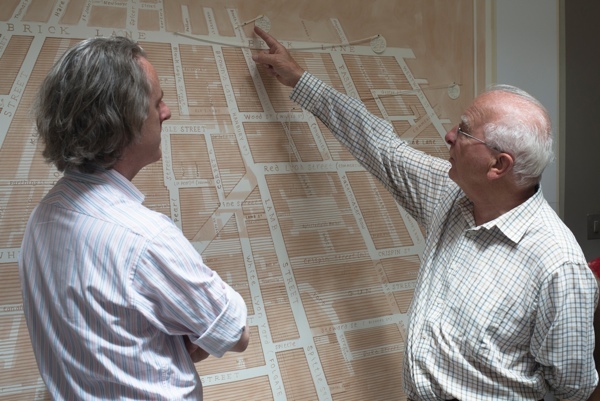 Dear Gentle Author, we write to request your assistance with getting my wife’s Huguenot ancestors onto Adam Dant’s map – I did try with the Spitalfields Huguenot group last year, but heard nothing further. Thanks for allowing a further opportunity as it was not possible to be in London (from Melbourne) when the map was being displayed. 1. CALAS: Antoine Calas and his wife Susanne Thoury lived in the 1760′s – 1770′s in BLACK HAWK Street, just near the corner with GREY EAGLE Street, where the original ‘chapel of ease’ was situated, before being relocated to the corner of Church (Fournier) Street and Brick Lane. Their daughter Susanne was my wife’s forebear – see below. 2. PROFICHET: Jacques Profichet and his wife Suzanne, with their two daughters lived in BROWNS LANE (HANBURY STREET) probably in one of the houses on the south side of Hanbury Street between Wilkes Street and Brick Lane – they attended La Patente French Church mainly. Their daughter Susanne is also a forebear of my wife’s – see below. They left France in 1749-50 from Caligny in the dept. of Orne. 3. MOUSSET: Jacques Mousset married Susanne Profichet, and they lived in WILKES (WOOD) STREET, in the last three houses before the corner of Wilkes and Hanbury Streets on the west side – a few houses up from where Stanley Rondeau’s people were. There were three sons – Jacques, Joseph who married Susanne Calas – my wife’s ancestors, and Samuel, and when Jacques (senior) died, he left a house to each son – numbers 29, 30, and 31 Wilkes respectively (the houses were demolished well before the war, and there is a rather ordinary looking commercial building on the site now, the corner building with Hanbury. 4. Other family names include SOREL, TAINE (who was from Norton Folgate) – both these two married Madelaine, the other Profichet daughter, and they lived – successively – in the Profichet home in Hanbury Street for a time. Jacques Profichet appears to have been a fairly successful silk merchant (not a weaver). Also GREW who were in Bethnal Green Road – Samuel GREW, an undertaker and a weaver, married another daughter of Joseph Mousset’s – another Susanne! – and their descendants are several in the UK. We thank you for your assistance in having their names added to the map, if at all possible. Lovely achievement. Given that this is the week in which an embroidered Magna Carta wikipedia page was unveiled at the British Library, it would be lovely to see a collaboration between Adam Dant and the Stitches In Time organisation that you profiled back in 2011. I would love to add my family’s details – how do I do this? Thank you for the contact email address GA, I think that I shall try to contact Fiona as my 4xgreat grandfather, William Tearoe, married Ann Delamare at St Margaret Westminster on 7 May 1764 and I believe that she was related to the Delamare family of silk merchants in Spitalfields. Abraham, Jacob, John and Pierre Delamare are all recorded as living in Steward Street and Lamb Street, Spitalfields in the early 18th century. There ought to be, but I’m not aware of any records before approx 1850, unfortunately …. P.S. “Edict of Fontainbleu” actualy, was the name of the enactment of Louis XIV that effectively expelled the protestants. “Wiki” says 22 October 1685, though IIRC, other sources say the 17th or even the 15th …. You have put out a last call for people of Huguenot heritage, and I would love to be able to claim at least a small amount of this ancestry, but so far I have not been successful. Although my maternal family have a very long history with both Spitalfields and the Silk Weaving industry, I have not been able to establish a firm connection to any French families as yet. I have been looking up my family history and have discovered this information in the Survey of London Vol. 27 1957 which shows my mother’s family name of Burman. I discovered this when looking up my ancestry, searching for my 2nd Great Grandfather, Henry Burman who was born in 1817 in Spitalfields, and although I cannot confirm I have any Huguenot ancestry, as I have little or no information about some of the women’s surnames who married into my family, it does appear that some Burman families have lived in Spitalfields since it’s inception, and I suspect it is possible that the Burmans and some Huguenot families would have at least met, as they were also Silk Weavers and lived in some of the streets you have talked about when referring to Huguenot families in previous newsletters. Meanwhile, pockets of buildings were appearing along the newly laid-out streets to the east. Alexander Cook, carpenter, and James Drew, bricklayer, both of London, built ten houses in the south-eastern part of High Street in 1686. More building was started by Nicholas Bell, carpenter of London, at the south-east corner of Church Street and King Edward Street, on ground leased from Henry Burman and Edward Probee in 1684… Heatley also leased a portion of the north-west side of King Edward Street from Edward Probee in 1684 and begun the construction of nine houses there. He seems to have run into financial difficulties, and been unable to complete the work. His mortgagee, Joseph Alford, draper, completed two of the houses in 1694. Henry Burman, Edward Probee and George Dashwood appear to have been lessees of sub-lessees of the Montagues in this portion of the estate. What really interested me was that when I did discover my 2nd Great Grandfather, Henry Burman, born in 1817, I also discovered he too had a strong, and ongoing, connection to King Edward Street, some 150 years after the first Henry Burman’s connection came to light. In the 1841 Census, Henry Burman and his wife, Eliza Burman nee Wheeler, were living at King Edward Street, Mile End Old Town, Whitechapel. In the 1851 Census the address was 6 King Edward Street, Mile End New Town, Whitechapel, Stepney. And although Henry and his wife, Eliza, were living at 21 Underwood Street, Stepney by the 1861 Census, they had moved back to King Edward Street, this time to number 19, by the 1871 Census. I am unsure if this is the same property in the same street, simply being renumbered as the street grew or a different property entirely. While I haven’t made an actual family connection to the 1600s Henry Burman mentioned in the Survey, the name Henry has been passed down through every generation of Burmans I have managed to trace so far, so I wouldn’t be surprised to discover a connection between the two Henry Burmans’ because of my 1800s Henry Burman living in King Edward Street, on and off, from the 1840s to the 1870s and beyond, albeit in what appears to be different properties. Either way, I suspect the King Edward Street in either Mile End Old or New Town as I believe it became, would be the same as stated in the London Survey, and could have been the very beginning of the creation of Spitalfields, (although I don’t have enough information yet to know if this is true or not). I do find it interesting that my 2nd Great Grandfather, Henry Burman, had such a strong and ongoing connection to what I can only suppose is the same street, King Edward Street. Some of the other streets my family lived in during their time in the Spitalfields area, in addition to King Edward Street, are Underwood Street, Whitechapel, Stepney, Leman Street Whitechapel, Thrall Street Spitalfields, Fashion or Fossan Street, Spitalfields, Fournier Street, Spitalfields, George Street, and Church Lane, Whitechapel. The earliest dates I can find are the 1750s, (John Burman Logwood Cutter and daughter Ann, born 1775 living in Thrall Street, Spitalfields) to 1760s, (James Burman Weaver and daughter Ann born 1764, living in Brick Lane, Spitalfields). Both children were baptized at Christ Church, Commercial Street, Spitalfields. As I said, I am uncertain as to any Huguenots heritage I may have, but did wonder if any of the London Survey information and family addresses would help your map maker in some way, (in particular the details about King Edward Street). I still wonder whether there was any likelihood of the Burman Silk Weavers coming into contact with Huguenot Silk Weavers, but that is yet to be discovered. 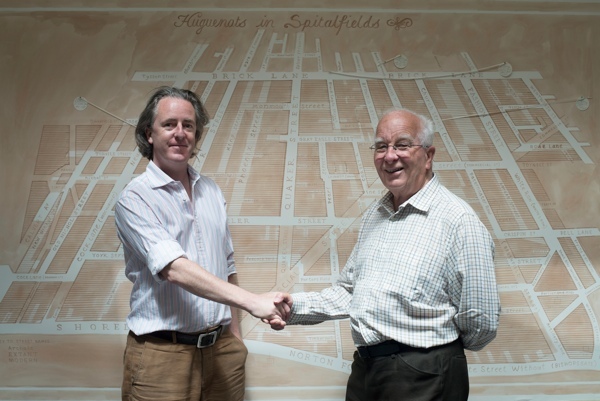 I am fascinated by the history of Spitalfields through to Bethnal Green (where my Grandfather was born in 1886), and ultimately to Lambeth, (where my mother was born in 1916), and really enjoy reading your newsletter as it does help me fit together some of my mother’s past history and her ancestry. My Great Grandmother was Lucy Ellen Lestourgeon (1853-1944).She was the third daughter of Charles Lestourgeon (1808-1891) a surgeon at Addenbrooks hospital Cambridge and a well- known Huguenot. My Grandmother Elizabeth Foster Marrack nee Butler was born in his house. The Lestourgeons fled France in 1685 and resided in Holland but they then came to England in 1711 and many of them resided in Spitalfields. Charles Lestourgeon’s Grandmother was Caroline Douxsaint (1742-1785). She married Aaron Lestourgeon in 1768 and she died after the birth of her youngest child Julia and was buried in the family vault in Christ Church Spitalfields.. The Douxsaints worshipped at Christ Church Fournier Street. Some of them were Horologists. So pleased I am able to leave a record of my Huguenot ancestor, Nicholas Marchand, of Duke Street (now called Fort Street) at Spitalfields who will be remembered when I am long gone! I have just spend a day walking around Soho and Spitalfields looking for information relating to my Huguenot ancestors, Delespine. I walked into Townhouse and was greeted by a very helpful gentleman who, on finding out that I was searching for my Huguenot history, showed me Adam Dants map. I was so excited to find that Isaac Delespine’s name was included on the map together with the road in which he had lived!! Thank you to both the gentleman in the shop and to Adam Dant – you made my day! OH My I missed this opportunity for my ancestors, they were weavers, Pierre De St Jean of Hare Street, and many others, also many still live and work in London today – what a lovely thing to do.. well done….